OCast ojaldes, Leon hojaldra, Eng leaf-pastry which has developed into the puff or flaky pastry known today. In the 15th C it was made with lard and rolled out thin with a stick the forerunner of the rolling-pin. The art of pastry making, including leaf pastry was brought to Spain by the Persians. Puff pastry was not developed until butter was used instead of olive oil which is commonly in the Mediterranean region. Although the French like to claim they are the inventors of all good recipes, it is unlikely that they developed puff pastry. It is not clear who the inventors were but the most likely regions are Austria, Turkey, Italy and Spain, as all were directly influenced by the caliphate in Baghdad. Stir the water into the flour, knead together, then gradually knead in the rest of the water. Knead for about 5-10 minutes until you have a smooth, elastic and slightly sticky dough that stretches instead of breaking when you pull it a little. Divide in four equal parts. Roll out on a floured board, or better floured marble, to at least 13"x15". Smear it with about 4 tsp melted butter. Roll it up. Twist it. Squeeze it together, flatten withyour hands to about a 5-6" diameter circle. If you wish, fold that in quarters and flatten again to about a 5-6" circle. 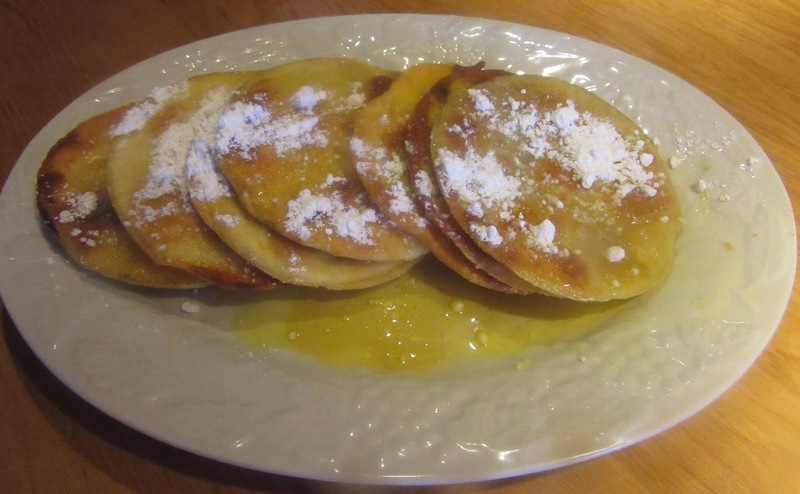 Melt about 1 tbsp of clarified butter in a frying pan and fry the dough about 8 minutes, turning about every 1 ½ to 2 minutes (shorter times towards the end). Repeat with the other three, adding more clarified butter as needed. Melt ¼c butter,heat ¼ c honey. Beat the cooked circles between your hands to loosen the layers, put in a bowl, pour the honey and butter over them, dust with sugar, and serve. If you are going to give it time to really soak, you might use more butter and honey. For regular flour, everything is the same except that you may need slightly more water. You can substitute cooking oil for the clarified butter (which withstands heat better than plain butter) if necessary. Se toma sémola pura o harina de trigo y se hace un amasado apropiado sin levadura y se rocía poco a poco y no se cesa de amasarlo hasta que se deshaga y tome su pinto y se ablande por donde se extiende un pedazo de él sin cortarse; entonces se pone un freidor Nuevo a un fuego moderado y cuando se ha calentado tomarás un pedazo de esa pasa y lo extiendes sobre mármol o sobre plancha en lamina Delgado y lo embadurnas con grasa fundida o con mantequilla deshecha en agua; luego enróllalo como una tela, hasta que se haga como una caña; luego entretéjelo y bátelo con tu puño hasta que se haga un pan delgado y redondo, y si quieres, dóblalo también; entonces lo extiendes y lo bates con tu puño por segunda vez hasta que se haga redondo y delgado; entonces lo pones en el freidor hasta que se ligue, luego lo sacas y haces lo demás hasta que termines la cantidad que necesites; luego lo bates entre tus manos y lo echas en mantequilla y miel; se hierve, y cuando se ha enfriado, espolvoréalo con azúcar molido y lo presentas. 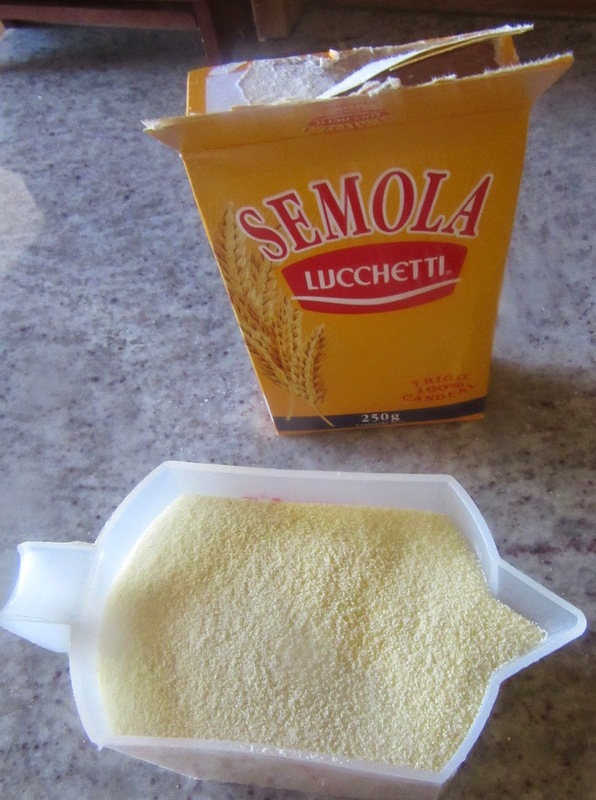 Take pure semolina or wheat flour and knead a stiff dough without yeast. Moisten it little by little and don't stop kneading it [p. 63, verso] until it relaxes and is ready and is softened so that you can stretch a piece without severing it. Then put it in a new frying pan on a moderate fire. When the pan has heated, take a piece of the dough and roll it out thin on marble or a board. Smear it with melted clarified butter or fresh butter liquified over water. Then roll it up like a cloth until it becomes like a reed. Then twist it and beat it with your palm until it becomes like a round thin bread, and if you want, fold it over also. Then roll it out and beat it with your palm a second time until it becomes round and thin. Then put it in a heated frying pan after you have greased the frying pan with clarified butter, and whenever the clarified butter dries out, moisten [with butter] little by little, and turn it around until it binds, and then take it away and make more until you finish the amount you need. Then pound them between your palms and toss on butter and boiling honey. When it has cooled, dust it with ground sugar and serve it.